When it comes to our automobiles, we’ve come to expect that safety not take a back seat to design. The form must incorporate that function. However in residential architecture, where architectural details and natural materials can play such a fundamental role in creating a sense of home, the limited availability of beautifully-crafted, architecturally-accurate wood doors that are also fire-safe can too often force a Hobson’s choice of “take it or leave it” and a door that does not match the rest of the home’s interior. Now, beauty and safety are no longer mutually exclusive. Bensonwood offers architecturally correct stile and rail wood fire doors and jambs, all crafted to the same standards as our homes. Whether for your new Bensonwood or Unity home, or à la carte as stand-alone assemblies, these fire doors are designed and built to meet the highest safety, durability and aesthetic standards in designs that complement the architecture—all while achieving tested and independently certified safety ratings. 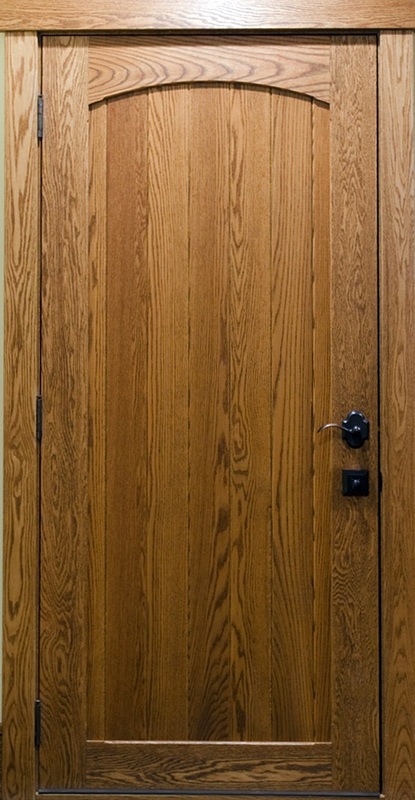 Available in a wide variety of styles and customizable designs, these fire doors include: thick, real wood veneers in a broad range of material and pre-finishing options, traditional mortise and tenon joinery and ball bearing hinges. The doors also include Fyrewerks’ cores made by combining intumescent compounds (a substance that swells as a result of heat exposure) with water-based ingredients and binding agents. When exposed to extreme heat generated from fire, the intumescent properties of the core expand to create an inorganic mass at the door’s core. 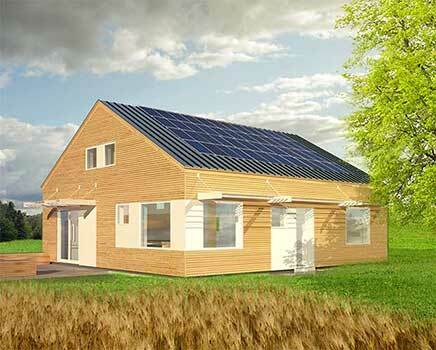 The result is a passive fire-retardant cavity that insulates the door for up to 90 minutes. All of our fire doors and jambs are certified by Intertek for 20-minute, 45-minute, 60-minute or 90-minute fire ratings. You can watch a video at left of a Fyrewerks door core being tested. Download a PDF about our new Fire Doors here: Fire Door Pamphlet-2. For more information, contact millwork @ bensonwood.com. Some ski homes high on the mountain have beautiful views down the valley. Others near the base lodge typically have great views up the slopes. This timberframe home at The Glades at Ridge Run, a new slopeside residential neighborhood at Sunday River Resort in Newry, Maine, captures both. Situated in the western mountains of Maine just three hours from Boston, Sunday River Resort has long been one of New England’s most popular four-season playgrounds, but what is so special about the property that owners Meredith and Jamie found here is that it sits uniquely midway up the mountain with expansive views above and below. Though Meredith and Jamie had just completed an extensive renovation on another home and weren’t anxious to begin a new construction, this was the first time a ski-on, ski-off home opportunity was available at Sunday River, so the couple knew they had to jump on it. They were also motivated to replace an old beloved, but small, ski lodge they had outgrown. Sensitive to the feeling of transplanting their relatives away from a getaway that had been in the family for years, they wanted an open concept floor plan with the feel of a true home. They also wanted to maximize family interaction, and minimize the size of the house to facilitate that function—as well as for aesthetic and environmental impact motives. Past renovations had taught Meredith and Jamie to be flexible but decisive, which helped in this first new house project. They also knew from experience that “design by committee” was something to be avoided, rather it was better to create a team dynamic between client and architect that respected roles and responsibilities, but also valued input from all parties. The mutual trust that developed allowed changes to be made fluidly and without conflict. The Bensonwood design team of Randall Walter, Curtis Fanti and Dave Levasseur, all avid skiers in their own right, were excited to create this special place from a perspective of years spent skiing and snowboarding. Their personal insights proved invaluable in informing practical aspects of the design. The architectural review process at the resort and the corresponding design standards requires development that complements the surrounding natural setting; minimizing the impact on the landscape while allowing for individual freedom of design to suit the needs of each homeowner. A common theme, described as a Northeast Cottage with Adirondack and Shingle Style influences, dictates the use of building materials, colors, landscaping and building style at the resort. The style is best illustrated in Summer Cottages in the White Mountains by Bryant F. Tolles, Jr. (2000), in which the use of native materials blended with natural colors provides an effective link to both the local environment and the great cottage architecture of the early 20th century. 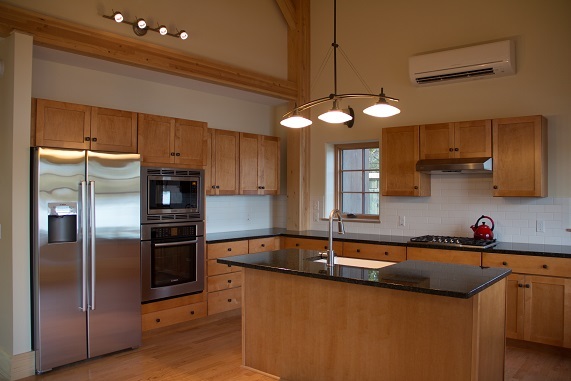 Working closely with the clients, the resort, the civil engineering firm Main-Land Development Consultants, Inc., and the town zoning board, Randall was able to design the energy-efficient home into a challenging site with steep terrain and protected wetlands. He was able to navigate the regulations and arrive at the design—a traditional Adirondack timber lodge style with a modern twist on the gables to accommodate the views—in a way that pleased all the parties involved. In the end, the review board process was easy and the owners got a home that fit their needs and respectfully fit the mountain landscape. Another welcome test for Bensonwood is the truncated construction timeline. 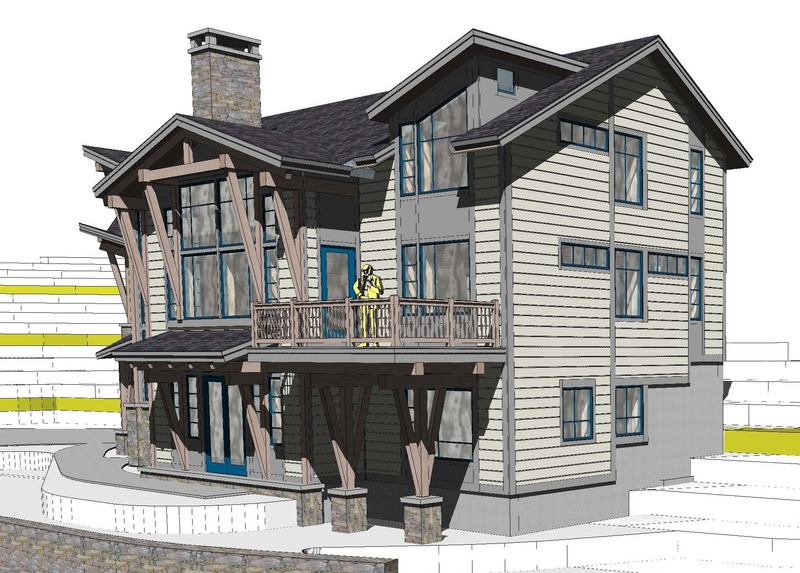 With designs finalized this past spring, the owners wanted to ski from the home this coming winter. 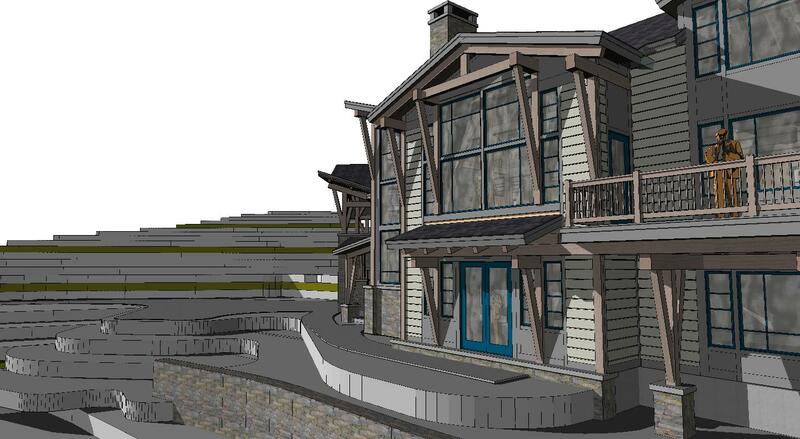 Anxious to prove that even a custom 3,900 SF mountain home on an undeveloped site could go up in record time with our Open-Built® systems and offsite fabrication, the Bensonwood team embraced the challenge. Rapid onsite assembly will also help cut build times in half over conventional construction, effectively giving the homeowners an entire extra season to enjoy the resort. Like many of Bensonwood’s mountain and shore homes, the house features gable roof lines, with one important distinction: these gables, dormers and bump outs will have asymmetric rooflines that permit both mountain and valley vistas as well as views of arriving and departing skiers. These roof angles, along with the heavy, rough sawn, red cedar clapboards, work to give the exterior its distinctive look: at the same time both traditional and contemporary, while the property’s southern exposure allows for plenty of natural daylighting and passive solar gain. On the inside every detail of the sanctuary, which will accommodate three generations of family, has been strategically planned. The owners wanted to maximize the use of space, and that included the kids’ space on the ground level, with the fun feel of a ski resort locker area. The ground floor has a rustic lumberjack-inspired kids zone, with a mud room off the garage, an open play area, a game room, a guest bedroom, a bunkroom with three beds, and facing his and hers bathrooms. 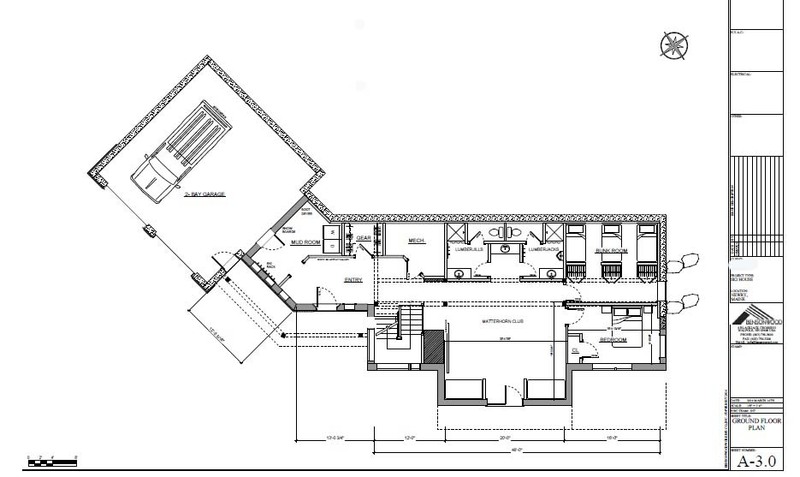 The first floor has a large open space plan with cathedral ceiling and a gathering area across from the kitchen/pantry and adjacent to the dining area. 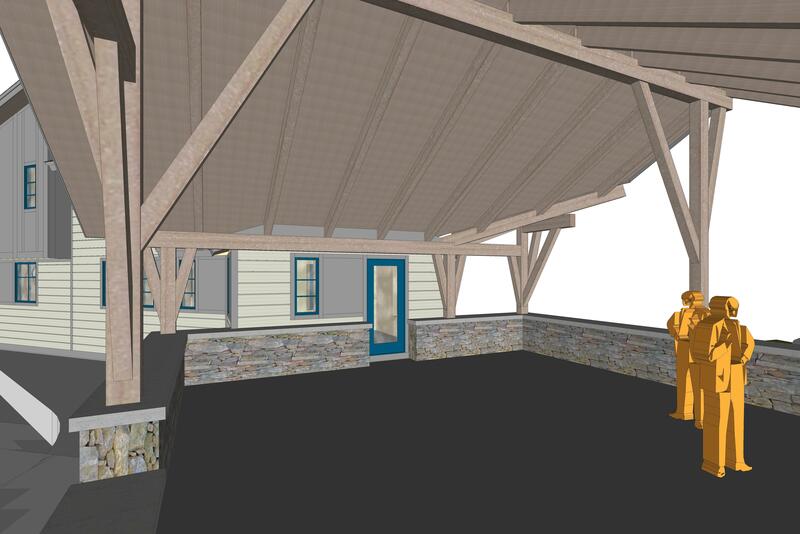 The dining room will have a long, farmhouse-style table with benches accommodating 10 or more. The second floor plan has three bedroom suites, each with their own bath, and a balcony open to the gathering area below. Perhaps the most unique feature of the project, however, is a very innovative ski-on, ski-off deck. The custom deck required Randall to create a multi-functional outdoor living space with views up and down the mountain in a style that also satisfied design review board restrictions. His solution was adjust the roof pitch and angles so skiers on the deck will still be able to enjoy the views, as he had done on the main house. Mindful of the homeowners’ sensitivities to limiting the home’s size, he placed the deck atop the garage so skiers will have easy to the home’s bathrooms and kitchen on the main floor when they ski home at lunchtime. Unique features include a hot tub—not tucked away in a secluded spot as is often seen—but in the open air on the sheltered ski deck so all guests have ready access. There are also ski and snowboard racks, overhead heating elements, a fireplace and a hot tub on the deck. One of the most creative elements of the home is one the clients devised. Rather than the traditional guest book for visitors to sign, the couple will immortalize them with a round timber into which they can carve their names and the dates they stay, creating a family legacy crafted in wood that will last for generations—just like the home. Architect Randall Walter predicts that, like many vacation homes Bensonwood has crafted over the past 40 years, this house will be used much more than originally intended, because families often discover they enjoy spending time in them so much more than in their primary residence. We are proud to announce that the Orchard Hill Breadworks Pizza Pavilion that Bensonwood volunteers helped build, is now open. 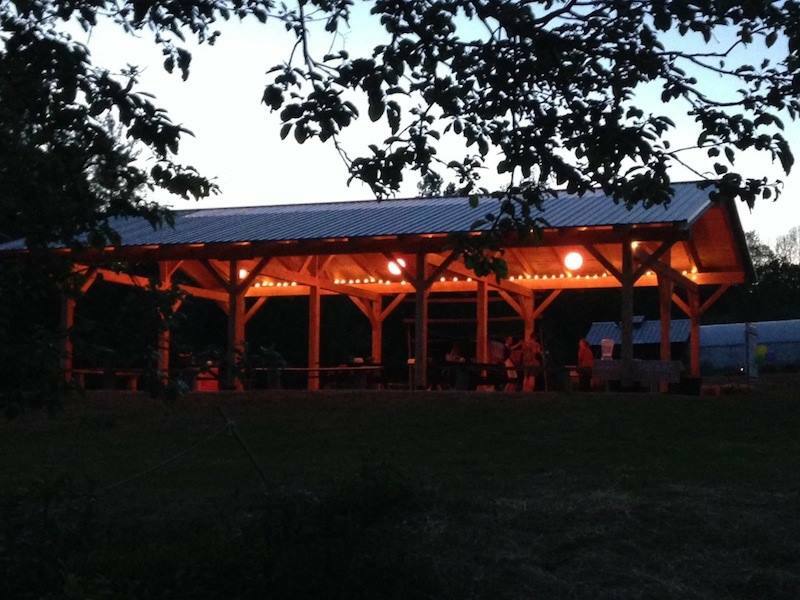 A community supported building project dreamed up in the summer of 2013, the Pizza Pavilion is a gathering place to celebrate and share meals. Its primary use is as a place to host benefi t Pizza Nights throughout the summer. The pavilion provides guests shelter and allow pizza night to go on despite the weather. Pizza Night started in 2007 as a small gathering of friends and family, but now attracts hundreds of guests every week of the summer with 100% of profits going to local nonprofit groups. Orchard Hill Breadworks, a small, rural bakery located in southwest New Hampshire, has given away almost $30,000, $500 to $1,000 at a time to about 20 different groups. Click here to see some of the beneficiaries and visit them on Facebook to keep current. This time lapse of the project tells a story of collaboration, cooperation and group effort. 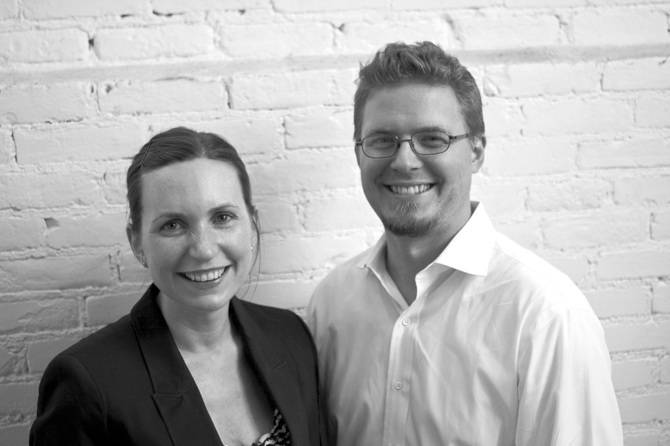 The Emerging Professionals Network of Vermont is a component of AIA Vermont, and serves local emerging professionals by representation on the AIAVT Board of Directors, while in turn educating members about important developments within the design and construction industry. The EPN also serves a larger purpose by organizing events and projects that bring together students, young designers and experienced architects, in order to promote architecture and good design in the community. Contrary to popular belief, public libraries are not a declining institution. Over the past 12 years (a period experiencing a dramatic expansion of the internet as well as a shrinking of public funding) yearly visits, program attendance and total income for Vermont public libraries have increased by more than 50%. Therefore, the issue is not making libraries relevant again, but strengthening the relevance of libraries for the future. 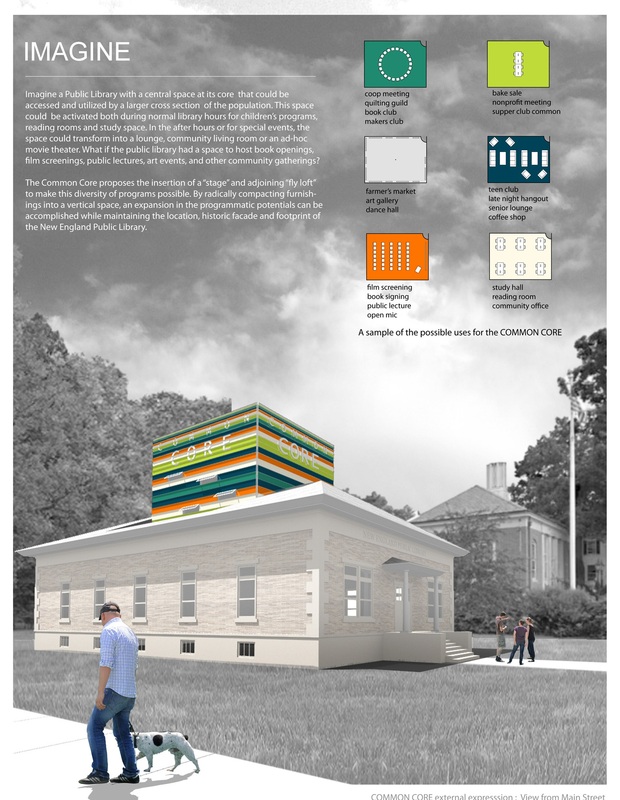 The competition asked emerging architectural professionals from around New England to design an architectural intervention that reinforces and expands the relevance of the public library. – How can architectural interventions catalyze the exchange of ideas in a library and its community? – What programs and amenities can attract new user groups while maintaining existing patrons? – How is a public library a distinct form of access for information, knowledge and discussion? – What is the contemporary function, role and identity of the New England public library? Entries came in from emerging professionals in Vermont, Massachusetts, New Hampshire, Connecticut and Rhode Island, with designs in the form of additions, renovations, and satellite structures under 2,000 square feet. 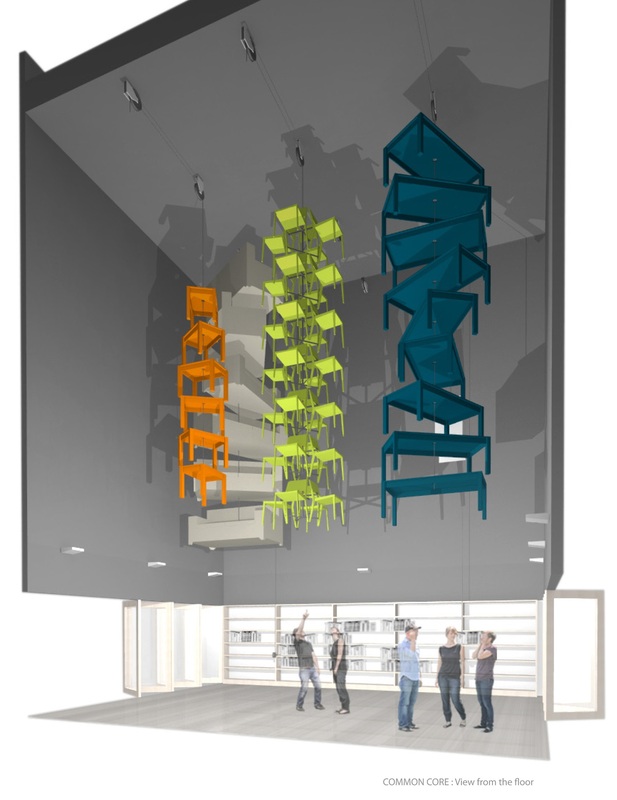 Winners were selected by a jury of architects, librarians and community members who considered graphic clarity, originality and cohesiveness of concept. Tim’s entry, The Common Core, proposed that libraries provide an essential and rare type of civic space where populations can collect and engage in the social construction of community through the cohabitation of a shared resource. Olson imagined a Public Library with a central space at its core that could be accessed and utilized by a larger cross section of the population. This space could be activated both during normal library hours for children’s programs, reading rooms and study space. In the after hours, or for special events the space could transform into a lounge, community living room, or an ad-hoc movie theater—a space designed to host book openings, film screenings, public lectures and art events. The Common Core offers the insertion of a “stage” and adjoining “fly loft” to make this diversity of programs possible. The exhibit will be displayed at the Pierson Library in Shelburne, Vermont, and then travel around the state with the AIAVT Design Awards. The Common Core offers the insertion of a “stage” and adjoining “fly loft” to make this diversity of programs possible. By radically compacting furnishings into a vertical space, an expansion in the programmatic potentials can be accomplished while maintaining the urban location, historic facade and footprint of the New England Public Library. The exhibit will be displayed at the Pierson Library in Shelburne, Vermont and then travel around the state with the AIAVT Design Awards. When husband and wife architects Alexander and Michelle Kolbe, co-founders of evoDOMUS, a Cleveland-based firm, wanted to design and build high-quality, sustainable homes in the U.S., they went looking for a manufacturing partner who could match the quality of homes they built in Alexander’s native country of Germany. They sought a montage homebuilding company of the caliber of the venerable Huf Haus and Baufritz, Germany’s leading off-site building companies, which helped establish off-site panelized building as the primary construction methodology throughout Europe. Both companies are more than a century old and, like Bensonwood Unity Homes, combine timber framing influences with advanced design and high-performance building. However, the Kolbes wanted a more personal connection to the client through the entire process—the level of attention a smaller company could provide—to reduce the stress homeowners often associate with a custom house project, such as designers not tuned-in to their clients’ needs, unreliable contractors, as well as schedule and budget overruns. After thoroughly researching high-quality panelized builders, fabricators and timberframers, the names Tedd Benson and Bensonwood kept popping up. So Alexander got on the phone and, much to his astonishment, Tedd picked up. Upon hearing of the Kolbes’ high standards and montage building interest, Tedd replied, “That’s exactly what we’re doing!” A meeting with Tedd and project manager Hans Porschitz followed and it was soon apparent that the synergies and shared values of the two companies were aligned. A relationship was established: Bensonwood would fabricate the evoDOMUS home shells. 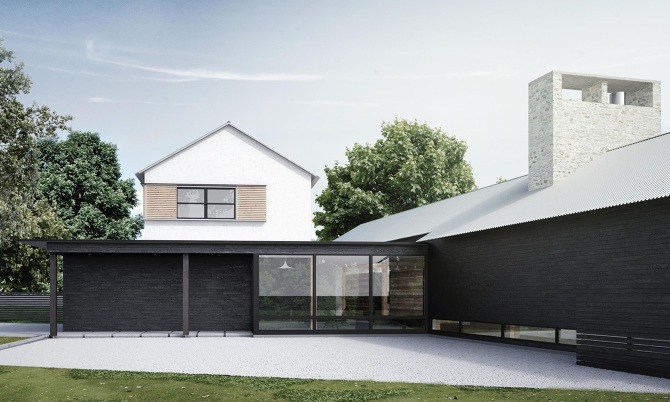 Now, the first joint project between evoDOMUS and Bensonwood is underway in Fairfield County Connecticut: a 5,000+ SF 4-bedroom Bauhaus-inspired modernist home in the “Cloud” Series of evoDOMUS homes. Strikingly original and family-friendly, Cloud is also inspired by current Mexican and Spanish interpretations of modern residential architecture. Customized to their clients’ needs, the home’s clean lines, contemporary materials and use of advanced building science are all characteristic of evoDOMUS home designs. Designing the home for its two-acre site had its challenges; its wooded setting with wetlands, an awkward slope and rock ledges all needed careful consideration. In addition, the home had to incorporate passive as well as active solar design, requiring precise siting along with design elements such as a south-facing second floor loggia to shade the first floor in summer months. The Kolbes’ strong focus on sustainability prompted the use of triple-glazed Loewen windows and a Zender Energy Recovery Ventilator, which recovers up to 90% of the energy of the extract air to warm the incoming fresh air, saving on heating costs. 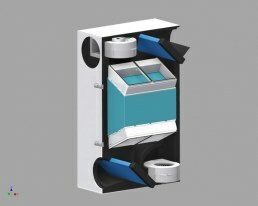 The air distribution system then channels the optimally tempered fresh air to individual rooms as needed. The exterior is clad in Resysta siding made of rice husks, common salt and mineral oil, which makes it both environmentally friendly as well as extremely weather resistant against sun, rain, snow or salt water. Resysta siding also requires minimal care and offers the look and feel of wood and can be painted. The home has 4,100 SF of living space with 2 stories above grade and a 900 SF finished basement and 924 SF garage. Off the garage are a mud room, a half bath and a yoga fitness room. The first floor has an open great room with living and dining areas adjoining another open space with a kitchen and family room. 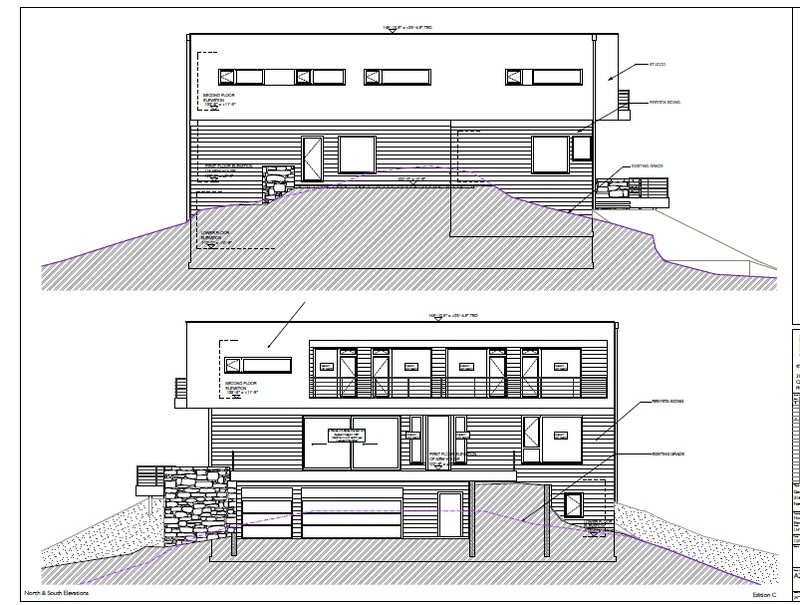 Rounding out the first floor is a bedroom/study with adjacent bath. 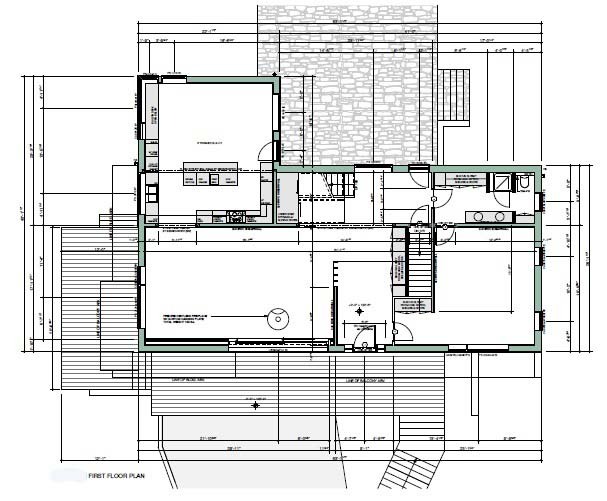 The second floor plan includes the master bedroom, three additional bedrooms (each open to a long balcony), a family bath, a study and a laundry room. EvoDOMUS uses low or no VOC paints and finishes in their homes and only formaldehyde-free materials. Material selections consist primarily of products with high-recycle content, as well as FSC certified woods and bamboo. 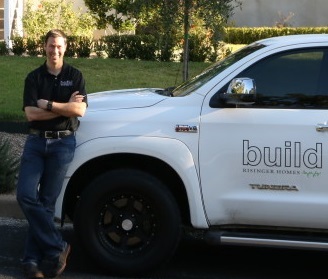 Alexander and Michelle Kolbe wanted to offer their customers not only the highest quality, sustainable homes available, but an excellent experience as well. By partnering with Bensonwood, evoDOMUS could put its resources into delivering superior design, customer service and care, rather than making investment in fabrication facilities, with financial partners and the loss of control and client interaction that would imply. By maintaining that control, evoDOMUS is able to fulfill its mission of making homes as beautifully designed and high quality as German cars—with a customer experience to match. On average, we spend 90% of our lives indoors, and approximately 2/3 of that time is spent at home. Today’s health conscious consumers will pay a premium for healthy, natural foods, but often give less thought to indoor air quality or overall healthiness of their homes. A recent McGraw Hill Construction report, “The Drive Toward Healthier Buildings,” finds that most homeowners turn to family, friends or coworkers for advice on home products and practices, with few requesting advice from the builders, remodelers and architects who know most about how these decisions might affect occupant health. However, homebuyers are increasingly concerned about the Indoor Air Quality (IAQ) of their homes. Pollutants like mold, radon, carbon monoxide and toxic chemicals are receiving greater attention than ever as poor IAQ is linked to a multitude of health issues. Some pollutants cause health problems such as sore eyes, burning in the nose and throat, headaches or fatigue. Other pollutants cause or worsen allergies, respiratory illnesses, heart disease, cancer, and other severe long-term health issues. At high concentrations, pollutants such as carbon monoxide, can be fatal. Given how important air is to life, let’s examine perhaps the most important attribute of Unity Homes, and properly built high-performance homes in general, which is how they can help you breathe easier and live healthier. 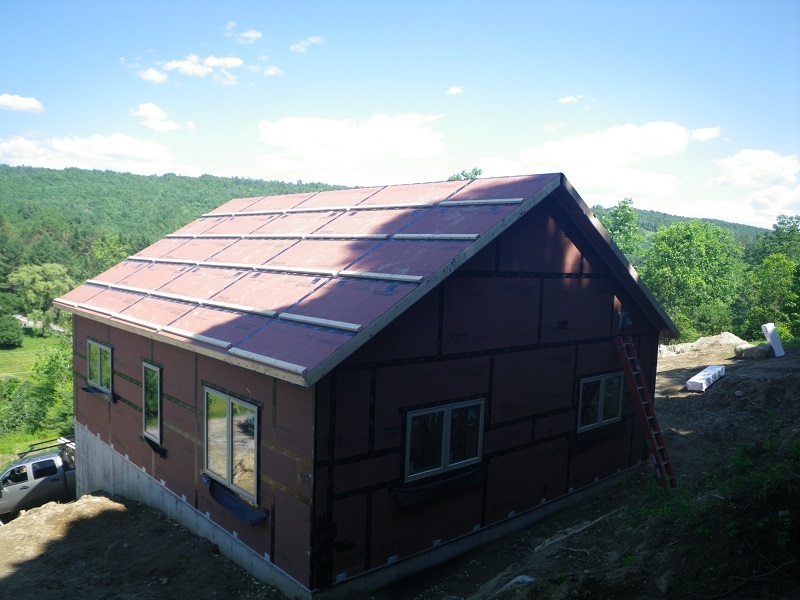 To start, only low VOC (Volatile Organic Compounds) materials and finishes are used in the construction of Unity highly-insulated, tightly-sealed, energy-efficient homes, resulting in exceptional levels of indoor air quality. Because of their extraordinary air-tightness, the indoor air is continuously replenished with fresh and conditioned air, reducing the energy losses that typically come from whole house ventilation. This is accomplished by the use of a standard Heat Recovery Ventilator (HRV) or optional Energy Recovery Ventilator (ERV) with adjustable humidification and dehumidification controls. Regardless of which ventilation system is chosen, Unity homes come standard with air-source heat pumps (for heating and cooling). When properly installed, an air-source heat pump can deliver one-and-a-half to three times more heat energy to a home than the electrical energy it consumes, according to the U.S. Department of Energy. This technology loses less humidity in the winter than with forced hot air/furnace systems that scorch the air at high temperature—driving off its moisture—making an outboard humidifier consume more energy to replenish it. Finally through filtration, allergens and other pollutants can be removed, making indoor air considerably healthier than outside air. Artist’s rendering of a Xyla 212. And while we’re on the subject, what exactly is “fresh air?” Most would assume outside air is fresh air, but whether you live in the city or the country, outdoor air carries pollutants in the form of gasses, droplets, and particles. This includes pollution from cars, trucks, airplanes, industry, tractors plowing fields, wood and crop fires, ground level ozone, and allergens like pollen. Indoor air, too, can contain a host of pollutants from combustion sources like stoves and furnaces, to high VOC building materials and furnishings, to household cleaning products and radon, to name a few. All of these pollution sources can cause health problems if not mitigated through green building practices and sophisticated air handling technology. Unity Homes, and other quality high-performance homes, help you breathe easier and live healthier by using only green materials and finishes, by sealing out unwanted moisture, dirt, dust, insects and allergens that can lead to health problems and costly repairs, and by conditioning and filtering incoming air. 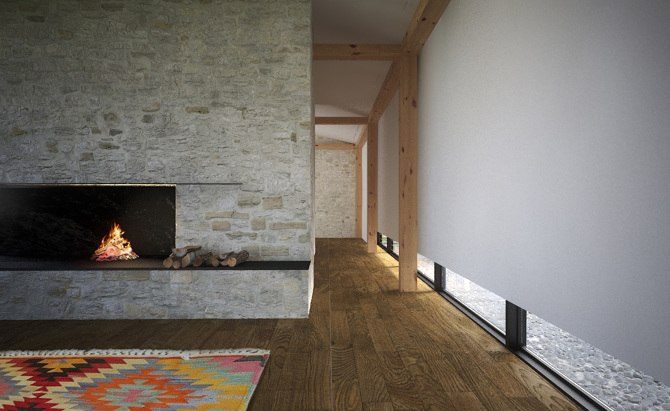 At the same time, Unity’s well insulated and tight building envelope reduces overall heating and cooling costs, and adds comfort by eliminating drafts and temperature variations. Moreover, while a Unity Home conditions your indoor air, its low-waste, precision offsite fabrication and super-efficient energy performance thereafter works to lower its impact on the outside air—which we all share—as well. A Unity Homes Xyla 212 under construction in Vermont. Our newest Unity, a Xyla 212 with an ERV in Montpelier, Vermont will be featured in our next newsletter.